This is a fabulous and creative project. If you go to Nat's site, you will get the sites of the other 2 womyn, Cat and Vicki in charge (with Nat) of creating this project. I will say no more and trust you will go take a look for yourself! as it doesn't all fit on the page here. thank you. 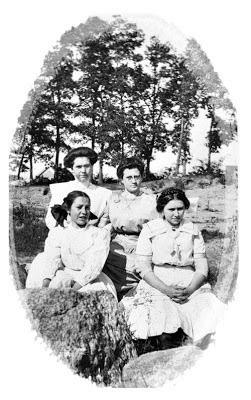 The Sisters knew throughout their childhood that their parents were set on them joining the Sisterhood in the next town. Three of the sisters, the older ones, were set with this idea and felt positive about it - actually looking forward to it due to the fact that this particular Sisterhood was in charge of the Music in the town and in charge of teaching music in the schools. 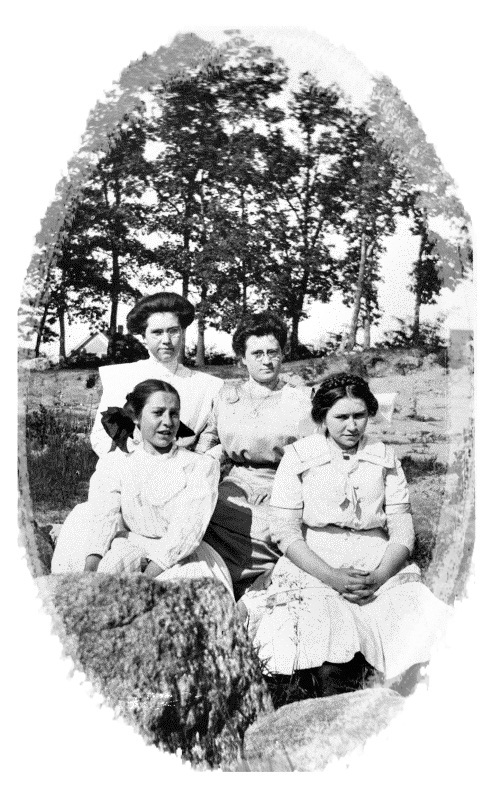 However, the youngest child, Marie, had no intention of joining the Sisterhood. The idea of going away, and being put to work at such and such a time of day and having lunch at such and such a time and everyone wearing a uniform was absolutely loathsome to Marie. She rebelled each time her parents talked about it, and especially in front of her mother and sisters. But no matter how hard they tried, the sisters could not convince Marie this would be a good life for her. Marie was a rebel. She wanted to travel. She wanted to paint, she wanted to take pictures, she wanted to make things with her hands. She didn't have an interest in Music like her sisters and her mom. Every night she cried, thinking her paints and her dreams of going across to the other side of the world to see the sites would remain nothing but dreams. When Marie was 10, her father Arthur, died. He was in the fields plowing and it was tragic for the girls and his wife. Especially Marie was devastated by his death. The family began to prepare Arthur's funeral and asked the sister's to prepare the music for the funeral, knowing they had the love of music and would be worthy of choosing appropriate hymns to represent who Arthur was - a generous man and a wonderful father and husband. Suddenly Marie felt a tugging in her heart, something she had not felt before. She felt a pull to create the service for her father - to have a hand in the music that would be chosen. Being the youngest, Marie had a very "special" relationship with her father and they had their special singing times, something that Marie did not exactly consider "choosing music as her career in the Sisterhood" but rather special time with daddy. Marie asked her mom if she could choose the hymns that she and daddy sang together. Marie's mom was stunned! She had never heard Marie talk about anything but distaste for music and its creation. Evette, Marie's Mom said: "Yes Darling, Of Course." Evette talked to the other sisters and told them she thought this might be the opening Marie needed to find her way into the Monastic life. Her older sisters agreed and gave over the job of music creation to Marie, with their supervision, of course. Not only did Marie pick beautiful hymns, she asked to sing them. At Arthur's funeral, Marie discovered "her voice." She discovered that her calling was singing. Marie discovered that it was not to teach singing to the other children in the town or at the schools but rather to sing in the towns and at the hospitals and at Charity events. There was plenty of room for this within the Sisterhood as their calling was Music as a whole. As Marie got older, she felt it was Arthur that spoke to her; that it was "Daddy" who was her angel - the one who helped Marie "find her voice." Thank you for reading my story and for looking at my art. Oh.... so fun! I love your pages AND your story! SO glad you are playing along <3 YAY! What amazing pages filled with awesome ephemera and love your story. Thank you for playing along with us! wow, what a story, I think it is sooooo awesome that both creating and story telling go together, it gives your creations life...fabby! A wonderful gift, a true artist you are...oh happy day to you! Your story is so very interesting...your creativity speaks a lot! I love your pages in your art journal. Love all that sewing stuff as it lights up my life too.